Use this worksheet when working with a designer which allows developers to take templated designs and apply the correct roles and functions for each design. This is a roadmap for taking a design and mapping data to client-facing templates. This worksheet helps avoid feature creep by keeping the client from adding additional features to the design. This Web Development Integration Guide is included in an editable format that can be customized for your own needs. This worksheet outlines the pages of the website in greater detail. It is meant to aid development of the project ad serve as a "roadmap" to tie in front-end features to back-end processes. The descriptions and classifications used in this worksheet with help to lay out the exact solution for development in order to meet all of the Software Requirements Specification (SRS) for the project. Definitions: Page Name The "friendly" name of the page, such as "Services". Navigation Element Here you describe the navigational elements this page belongs to, or is accessed from. Terms such as "Main" or "Sub-Navigation" are understood to have been previously defined or decided upon by the time a document like this is required. Page Category Here you indicate whether this page belongs under a certain section or classification – such as ADMIN or "Sub-Navigation". The Categories you choose should have some logical meaning and context to the end user of this document. Template Used If a specific template is called upon, you would list that here. File Name The exact file name of the page being described. In the case of a data-driven page, you note the control file (e.g. index.php) and any additional information about the page and file structure that is different. And then you would need to define any functions in the above url if they are important to the description of the page and its functionality. Access Role Used Describe the access role(s) used to interact with this page. Access roles are used to restrict certain features to certain users. Example: Your project or website may have roles such as : Public (Everyone), Registered Users (Users who have given you certain information and you allow them to create an account with a login and password to access more features) Dependencies Here you list any important files or data that this file calls in order to function. These can be includes, XML feeds, scripts or other resources. Access Role Used Public, with a login page for Registered Users Dependencies Header. Describe any additional functionality this page may have or any features it may contain. The Homepage is where we want to make the most visual impact, both graphically and with the main message we want viewers to take away when they visit the site. The use of a primary graphic area – a "Hero Offer" spot will rotate a graphic image w/ text to promote our three primary product offerings. 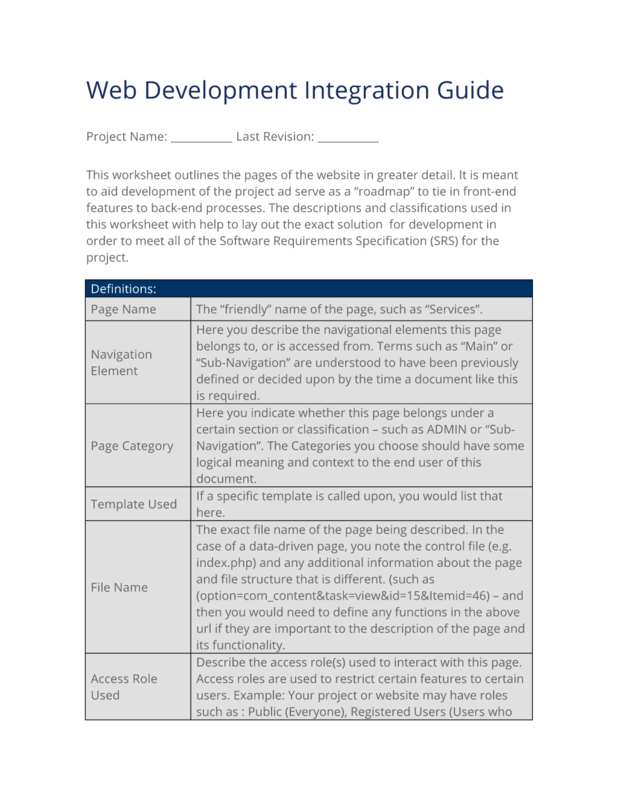 The editable Web Development Integration Guide document - complete with the actual formatting and layout is available in the retail Proposal Kit Professional.